April 6, 2017 at 10:29 am EDT | by Lou Chibbaro Jr.
A gay member of the Dupont Circle Advisory Neighborhood Commission on April 5 posted an online petition calling on Mayor Muriel Bowser to arrange for the installation of rainbow colored crosswalks on a section of 17th Street, N.W. where several gay bars and restaurants are located. He said that he and others who have joined his campaign for the crosswalks would like them to be placed in several existing crosswalks along 17th Street between P and R Streets, N.W. In recognition of the longstanding presence of LGBT people who live, work, and patronize businesses in that location, former D.C. Mayor Adrian Fenty arranged for that section of the street to be assigned the name Frank Kameny Way in honor of the late D.C. gay rights pioneer Frank Kameny. Downs noted that the petition, which was posted online about 9 a.m. Wednesday, had over 200 signatures as of early afternoon the same day. He posted his petition less than a week after the subject of the Rainbow Flag became widely discussed on the occasion of the death on March 31 of Gilbert Baker, 65, a gay artist who is credited with creating the Rainbow Flag in 1978 in San Francisco. 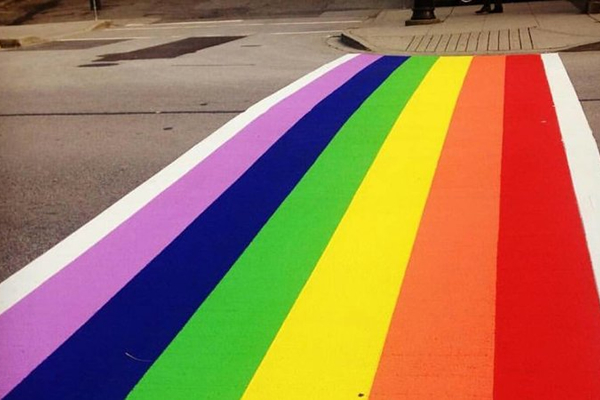 Rainbow crosswalks have appeared in other U.S. cities in recent years, including San Francisco, Seattle, Atlanta and Philadelphia.